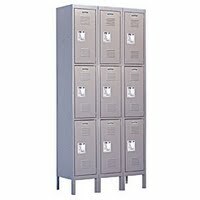 1) Why are the Lenox Z Lockers considered unique? The Lenox Z Lockers are unique for several reasons. Their design allows for two tier stacking with both of the lockers having sufficient height to hang clothes. This minimizes the floor space required when comparing them to traditional lockers, which would need double the floor space. They are also 100% plastic will never rust or delaminate. 2) How do you repair the color if the Lenox Z Lockers is scratched? Since the color is infused throughout the plastic, there is no need to “repair” any color. 3) Are the handles on the Lenox Z Lockers ADA compliant?